I hope you all had a great weekend. It’s been a good one around here. Got to visit the library, do some crafting, reading and I even went to an estate sale and bought a couple of vintage postcards. I’ll have to share those with you in an another post. I’m not sure what I want to do with those postcards yet but maybe they’ll end up in a journal. That was my first time at an estate sale and wouldn’t you know it, a fight broke outside over some items. Holy moly. Luckily, I got my postcards without having to fight anyone over those. Anyway, we all know that I have a fondness for journals (those I buy & those I make) but you know how after Christmas Barnes & Noble discounts calendars? I found The Reading Woman Engagement Calendar and thought why not. I currently have about six journals in rotation but I thought this would be fun to just document bookish things. Different from my blog, in that I can alter this with paint, stickers, whatever. So here is the what it looks like so far. I added a picture from my GoodReads Year in Review graphic, a picture of some books I talked about here on my last blog post, some quotes and an instax picture of my nightstand. There are is also washi tape and a sticker from Andi’s shop. I honestly don’t know if I’ll be able to keep up with this one but so far it’s kind of fun. Plus, this will be a journal that I can cut up after the year is done if I want to and save the pictures and quotes. So, even if I don’t end up completing it I think I can have a lot of fun with this one later. 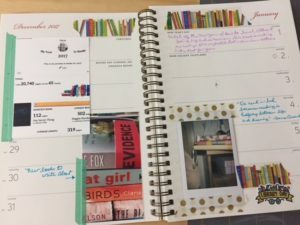 Aside from your blog, do you also keep a reading journal? Would love to hear more about that so please share! This DOES look like a lot of fun! But I know I’d never keep up, and it would just be more ‘cliutter’ on my shelf to make me feel guilty. I experimented with a reading journal online a couple of years ago, hosted on my Google Drive, but it was more to record new-to-me vocab and my impressions of what I’m reading. And I found that I was spending so much time on it, that it actually took away from my enjoyment of reading. I’ll be interested to follow your progress. Enjou! That is really cool and I love the idea of documenting with pictures of various things. I do keep a reading journal – written – though it is just the title, author, date finished, what type of read (print, library, audio). Last year I started adding the first sentence and, for a while, the last sentence of each book. I stopped the last sentence after a while, but I’m starting that again this year. I find that reading those two things brings the book back to me more vividly. Can’t believe about the fight at the estate sale! What an odd thing! Although I sometimes comment in my regular journal about reading, I don’t always. When it comes time to write a review, it is nice to be able to have some of your thoughts available…and even more important, next year or the next, you have a reminder that gets to the heart of your memory. Great idea to have images included as well, Iliana! I wish I was so dedicated to keep a reading journal like that. It looks like it is so worth the effort and later you can look back and enjoy your reading year in a different way (than a boring spreadsheet like I keep!). I love vintage postcards–for a while I collected them, but mostly the ones I like the best are still a little too steep to buy. (When I should be saving money that is, rather than spending it). So awesome! What a fun idea. I hope you are able to keep it up, would be amazing to see what it looks like at the end of the year. That’s fun and creative! I hadn’t thought about keeping a book journal in a calendar, but that could really work. I use my blog and Goodreads and, sometimes, I still miss a book. Just the other day I picked up a book from the library that I was sure I hadn’t read because I had no record of reading it. But I had read it — sometime in the last year or so because it was published in 2016!